Whether you have moved into a new home, or the children have left and you want to redesign the master bedroom, there are some things you should consider before you start. One of the newest bedroom trends, probably because more of us now spend time away in hotels, is a bedroom seating area. A space to sit, even in a small bedroom, can provide a quiet and private area where you can read or write letters. Even if your bedroom is small, rearranging the furniture, and maybe getting rid of some of the larger items can make a difference. En-suite bathrooms have been a part of many people’s master bedrooms for some time now. Having an extra bathroom can be a real boon, especially when you have guests in the house. Adding an en-suite bathroom will depend on the size and situation of your bedroom. Many homes have an extra loo, or smaller bedroom near the master bedroom, and a good builder could soon do the necessary major work for incorporating that additional space. You may want to seek advice about using an extra bedroom, as the loss of one could affect the price of your home if you decide to sell it in the future. You may already have an en-suite bathroom, or find the cost of installing one a bit much right now – but that doesn’t mean that you can’t make some creative changes. Give your bedroom a whole new look by redecorating. You will find plenty of design and decorating inspiration online – try Pinterest, for example. First, you need to decide what sort of budget you have for redesigning your sleeping space. Just a few simple touches, for example new curtains, bedspread and pillows can make a significant difference to a tired looking bedroom. Use little splashes of colour by repainting one wall in a bright, new shade, or add some brightly coloured cushions to your bed and in the sitting area. Try moving your bed and any moveable furniture to different parts of the room, as this can make a place look completely different. Adding a large, framed mirror to one corner of the room can make a space look and feel larger than it is. Change your main light fitting and shade to something new and different. Add beautiful bedside lamps and a soft, multi-coloured rug if you don’t already have them. Just a few changes can make your bedroom more welcoming, and somewhere that you want to spend a bit more time when you are not sleeping. If you are getting ready to improve your home with a few renovations you’re probably also looking into possible ways to save some money. Everyone wants to refurbish and upgrade their home, but most people don’t want to empty their wallet to do so. 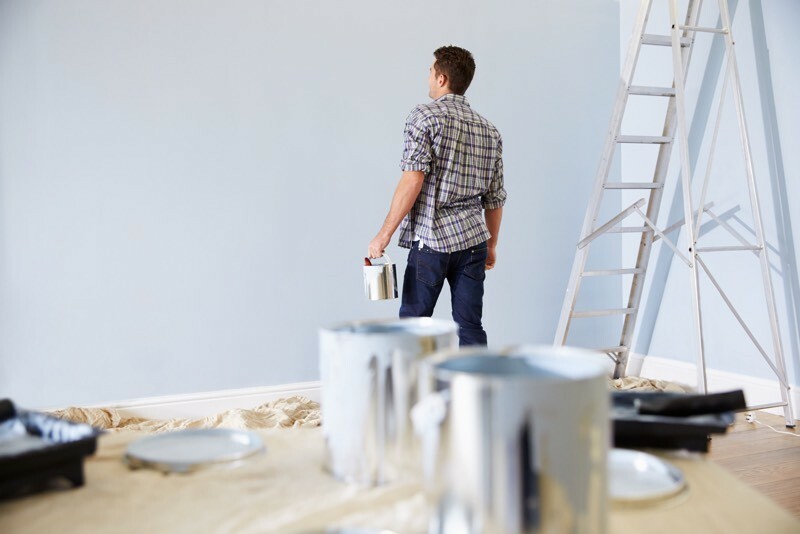 The good news is that there are a few great ways to save some money and still get a brand new look that will immediately make your home look new and trendy. The most important lesson is to make sure that you are doing the work efficiently the first time around, so that you don’t end up spending much more to repair a mistake or fix a bad judgment call. The very first thing you should do before you start any DIY project is to look at the current trends and styles. You want to choose something that is stylish right now, but also something that is going to stand the test of time. You don’t want your new kitchen to look dated next year, which is why choosing a timeless look will always give you the most bang for your buck. This way your renovation will continue to look stunning for years, saving you money down the line as you won’t need to upgrade for a while. Cabinets are always a great way to start any renovations, as are any counter space areas if you are thinking about starting in the kitchen. Pine is a great look and tends to cost less than other types of wood. You can also choose to place a splash on your counter tops by using new paint splash kits. These make it look as if you have ceramic counter tops, and are so simple that anyone should be able to master them and get a great result. If you are in two minds abut changing your cabinets, consider just changing the hardware. Updating the hinges and hardware is a great way to update and beautify your space easily, cheaply and quickly, improving the whole look of your kitchen. Finally, if you want to update your bedroom, you might start by just changing your curtains; a simple adjustment to the colour scheme can dramatically improve the ambience of the room. You can do the same in a living area; maybe consider switching flooring from hardwood to carpet – or vice versa. Sometimes changing the flooring alone is enough to completely change the vibe of the room and can leave it looking much more appealing. However you spend your days, whether at work, taking care of children, attending school or any of the various activities that constitute daily living, everyone wants a nice bedroom to collapse into a the end of a long day. For most people their bedroom is their sanctuary – and the one place they can escape to for some peace of mind. However, a bedroom can be even more than this, if you step it up a notch and add some luxury to your room. A short-term upfront investment can allow you to sink into the lap of luxury at the end of the day, making your bedroom literally the best thing you have in your life. The first thing you need to do if you are focused on turning your bedroom into a luxurious sanctuary is buy a luxury bed. Many luxury bed hunters will look for something that has a very ornate design made out of hard wood or metals. Adding a canopy to the bed can really add a formal-but-cosy feeling. Keep in mind that, with beds as with so many other things, you’ll get what you pay for. If you are willing to pay a bit more now you will likely get a much more durable bed, that you will not need – or want – to replace any time in the near future. Remember that spending a bit more upfront will almost certainly save you more in the long run. Just because your bed becomes the focal point of your room, however, does not mean that it should be the only piece of high-quality furniture. You will also want to choose some eye-catching items to add a bit more allure and sophistication to the room. An armoire is a great way to make a room look grand, even royal; whereas a claw foot chair, a bedroom table with glass, or solid wood end tables can be great accents to tie together your theme. If you choose wood pieces, make sure that they all match, or that unmatched pieces complement each other. Finally, you need to accessorise the room to add the last finishing touches. Long mirrors can help add some depth to the bedroom, whereas floor lamps or an elegant chandelier with low voltage light bulbs can help to enhance the space with soft lighting. A bedroom bench is another great addition; or consider a hope chest that can serve as a bed bench, as well as a great storage spot for extra bedding, maximizing your space. Consider also placing an area rug under your bed for a cosy final touch. Re-purposing old furniture has become very popular over the last few years with people taking old pieces of furniture and turning them into something completely new and stunning. You can buy one of these pieces at many fairs and craft shops, or you can learn how to make some of these pieces for yourself. The following are just a few unusual furniture ideas for your home that you can make with old pieces that you have lying around the house. This way you can update your home without spending too much money on new furniture! One great thing you can do is take an old bookcase and turn it into a bench seat with storage underneath. Simply cut it down so that there are only one or two drawers left and then place a bench pad with some fabric across the top of it. Instantly you have a great place to sit and some drawers that you can use to help keep organised. This is a great idea for a hallway, so that shoes and boots can be kept stored away and out of sight, and you have an extra seating area. Another great idea is to take old chairs from your kitchen table that might be broken or just old and turn them into a bench that you can sit on when you are out on your patio. Simply take the old chairs and cut off the seat part and the front two legs leaving the backrest and the back two legs. Place one on each side of a box frame that you cut to be the width of the chairs and about two to three feet in length. Paint everything to be the same color and then place a pad on top to sit on and instantly you have an outdoor piece of furniture! Many people have old filing cabinets sitting around that they no longer need, but you can make this piece of office furniture into a great storage solution. Take out the drawers and flip it onto its closed side. Repaint the entire cabinet into a fun color such as red or blue and then you can use it to store your rakes, shovels, mops, etc in the garage! Each slot can hold a different type of cleaning supply so that you get extra life out of something you otherwise might have thrown away! Vintage headboards can often still be used in their intended fashion, particularly if people want to have their entire bedroom re-imagined with a classic, retro design. However, if those headboards are now damaged or simply unfashionable, what can be done with them other than just throwing them away? The reality is that there are a number of ways in which vintage headboards can be used for something other than their original purpose – and in a stylish and appealing manner too. All that is really required to come up with ideas to use vintage headboards is a little bit of creativity. Vintage headboards can be recycled and reused as everything from a coat rack to a bench, a desk and even a garden gate. The same kind of recycling and design that can turn a vintage headboard into a coat rack can also be used, with only a very slight modification by a joinery specialist to turn it into a rack on which pots and utensils could be hung in the kitchen. A full size headboard could also be used to spruce up furniture, perhaps serving as the head rest of a seat bench; either a stylishly comfortable one for inside the home, or a more functional item for when you need a rest in the garden. Headboards can also be redesigned and repurposed for use as a greeting sign outside the house, perhaps bearing the name you have given to your home if you’re so inclined. An even more imaginative use for a vintage headboard is to have it fitted with a chalkboard, potentially making it a very stylish and useful item for a restaurant or cafe. Those rare vintage headboards that have been made out of metal can be particularly effective to be recycled as striking garden gates. Vintage headboards could be even be reused in the bathroom as a wall-mounted towel holder. The truth is that there is an almost endless array of ideas for how a vintage headboard can be recycled and reused as another item, remaining attractive while also being completely functional. The limit is merely your imagination, so anyone who is stuck with a vintage headboard that for whatever reason they no longer wish to make use of in the bedroom, simply has to do a little research (there are plenty of pages on the internet dedicated to just this topic) and exercise their imagination, to come up with the perfect vintage headboard idea.